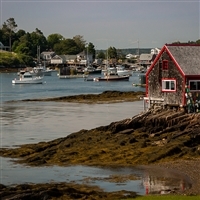 Islands of Maine - Cruise, Tour, Dine and Ohhh the Views! 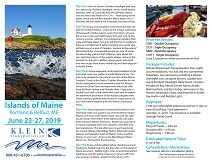 Islands of Maine- Cruise, Tour, Dine & the Views! Depart early morning and head straight for Maine. Stop for a photo-op at the historic Portland Headlight, first lit by whale oil on 1791; set on a bluff, boasting sensational views of fabulous Casco Bay and the Calender Islands. After a long day of travel, check check into your hotel in Portland, ME. Enjoy a full breakfast this morning before checking out of your hotel. Depart for the beautiful Portland Harbor, where you will leave on a cruise of the unique waterways of Harpswell to Bailey Island. Learn the History of Casco Bay as you cruise past lighthouses, forts and turn-of-the-century summer colonies. Pass lobstermen tending their traps and Eagle Island, home to Admiral Perry's residence. After returning to the harbor, depart by motorcoach for Camden, ME where you will meet up with a local tour guide and enjoy a tour of beautiful Camden. Venture to the peak of Mount Battie for unsurpassed panoramic views of scenic Penobscot Bay and the Gulf of Maine. Hear about the rich maritime history of this seaside village. Check into the hotel this evening in Belfast, ME. Enjoy breakfast at the hotel this morning before departing for the Mount Desert Island Tour. This is the largest island in Maine and second largest in the Northeast, beat only by Long Island. Meet your guide at Acadia National park and be amazed by the natural wonders of this Maine Treasure. You will travel to the Peak of Cadillac Mountain for breath-taking views of the mountains and the Atlantic. Venture to Otter Point and experience the rocky cliffs jutting out into the crashing surf. Witness the wonder of Sieur De Mont Springs and the power of the surf at Thunder Hole. Enjoy a yummy lunch, expertly prepared, while taking in the ocean views. After lunch, take time to explore downtown Bar Harbor, which is filled with shops, eateries, galleries, and musuems. Here you will have dinner on your own. After dinner, experience all the thrills and spills of the Maine Lumberjack Show. See axe throwing, log rolling, hand sawing, timber climbing and more! After breakfast, you will meet up with your guide for the Boothbay Harbor Tour. You will see why the Boothbay Harbor Region is the "Soul of the Maine Coast." Explore quiet coves, rocky shores, meandering country roads, and beautiful lighthouses. Discover this beautiful coastal region including spectacular Ocean Point Drive, three lighthouses, salt water birds and local lobster fisherman. Next we will cruise to the picturesque Cabbage Island, where your Downeast adventure begins. A succulent Maine Lobster feast awaits you! A traditional Maine bake, cooked in seaweed, steamed from top to bottom, covered with tarpaulins and rocks capturing all the flavor and sweetness of fresh Maine lobsters and clams. This authentic meal includes a steaming cup of traditional New England Fish Chowder, two luscious bright red lobsters, tender white steamed clams, sweet golden corn on the cob, onion, and new Maine potatoes. Once you arrive back to Boothbay Harbor, take some time on your own to explore this delightful coastal village filled with shops, eateries and beautiful views of Maine's rocky coastline. Dinner is on your own this evening. Arrive in Portland, ME and check into your hotel for the last night in Maine. After breakfast at the hotel, check out of the hotel for your trip home. Stop for a photo-op at Nubble Light, one of Maine's most photographed Lighthouses. Four Nights' Accommodations, Round Trip Baggage Service, Two Full Breakfasts, Two Expanded Continental Breakfasts with Hot Choices, Two Luncheons: Inclunding One on Mt. Desert Island & One Traditional Lobster Clambake on Cabbage Island, Two Complete Dinners, and All Attractions listed in the Itinerary.